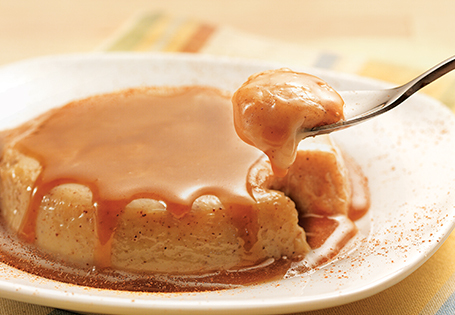 No-bake flan with caramel sauce. In a large saucepan over medium heat, combine milk and evaporated milk. Cook for approximately 10 minutes, until small bubbles appear on the bottom of pan when tilted. Remove from heat. In a medium bowl, whisk together remaining flan ingredients. Slowly whisk a small amount of the milk mixture into the egg mixture, to prevent scrambling the eggs. Continue whisking in order to bring mixture to room temperature. Whisk the egg mixture into the remaining milk mixture and return to stove. Cook over medium-low heat for an additional 10 minutes, or until thickened. Strain mixture into a medium bowl. Fill 10 ramekins 3/4 full with the custard mixture and chill for 1 hour. For caramel: In a medium saucepan, melt butter over medium heat. Add brown sugar and stir until combined. When butter and brown sugar starts to caramelize, turn heat off and whisk in half & half. Allow caramel to cool slightly. To serve, use a butter knife to loosen flan from sides of ramekin. Invert ramekin onto a small plate. Drizzle 1 tablespoon of caramel on top of each flan.